Members of Parliament have rejected for a third time Prime Minister Theresa May's Brexit deal, the withdrawal agreement she sealed with the EU to take the UK out of the bloc. Despite the result being closer than the previous two rejections, MPs still voted it down by 344 to 286, a majority of 58. The vote came on Friday 29 March - the date originally set for the UK to leave the EU. Failure to do so means the UK now has only until 12 April to come up with an alternative - perhaps a longer delay to Brexit - or face leaving the EU without a deal. Massive uncertainty for the British people and business remains. What vote was on offer this time? For Friday, the prime minister split her Brexit deal in two, allowing MPs to approve the legally binding part of the agreement while leaving the political declaration - which outlines plans for the future relationship between the UK and the EU - to one side. This was partly because the Speaker had said a vote could not be put in front on MPs again without significant differences. But Mrs May also thought that her pledge to her Conservative Party that she would not remain as PM through the next phase of political negotiations if the deal were passed - combined with a fear among Brexiteer MPs that they could lose Brexit altogether - might attract enough votes to get the withdrawal agreement through. Key members of the Conservatives, including Boris Johnson, former Brexit minister Dominic Raab and Jacob Rees-Mogg, said they would support it. But, crucially, Mrs May's government allies - Northern Ireland's Democratic Unionist Party - opposed the deal, as did the main opposition Labour Party and 34 Conservatives. So where does this result leave us? The government now has until 12 April - the date by which the UK must indicate whether it will put up candidates in May's European Parliament elections - to indicate a way forward. The EU's chief negotiator, Michel Barnier, says there are two choices - leaving without a deal or a having a longer extension, which would involve taking part in the elections. Given that Parliament's previous votes have been solidly opposed to a no-deal Brexit, many commentators feel the extension is more likely. However, Mrs May has said she does not want the UK to take part in the EU elections. And any extension would have to be agreed by the EU - by no means a certainty. Following Friday's vote, European Council president Donald Tusk announced there would be a council meeting on 10 April. The bloc would need to decide whether the conditions for a longer delay would be met. Ahead of Friday's vote, Mr Barnier said a no-deal Brexit was looking more likely and the EU should be prepared for it. There is a third option - the UK could revoke the so-called Article 50 and cancel Brexit altogether - but this appears very unlikely. 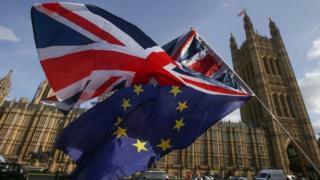 Friday's vote came after an extraordinary session of Parliament on Wednesday, when MPs rejected eight different proposals on Britain's withdrawal. The plans ranged from holding a second referendum to staying in a customs union to leaving the EU without a deal on 12 April. All of them went down. On Monday, some of the most popular of Wednesday's rejected proposals - including a second referendum - could be put to the House of Commons for a second time in the attempt to break the impasse. Others insist that the only way forward is a general election to create a new Commons that will hopefully be able to find a path. Where Mrs May will be over the next few weeks is also up in the air. She pledged to stand down if the deal passed, but many now question whether she has the authority to stay.